Crystal's yeast infection story was made possible because she found my website and made a submission to me asking me if what happened to her son, Jakob, had ever been heard of before. I later asked this wonderful young lady if she would share with the rest of the world Jakob's story to maybe help save another child from having to undergo what her son Jakob has had to experience. I have also included some of my comments back to her as our conversation took place. I have a 6 yr old son who was born premature. He caught a yeast infection from someone else in the neonatal unit he was in. The yeast infection got into his blood. It filtered through out his body and ate holes through his eyes causing permanent blindness. Has anyone else ever heard of a case where this has happened? Now I know that yeast infections and fungi can indeed attack the eyes as it has the ability to attack anything it wants to. It usually attacks the cornea first and then moves into the retina and surrounding tissues and it can indeed cause blindness. Since Crystal's little boy is 6 years old now I also asked her how the doctors got rid of the infection and if I could share her sons yeast infection story in the hopes it could save someone else. Below is her reply. Thank you for contacting me. Sure you can use our story for publication. At the time there were only 5 anti-fungal medications available to treat him with. I'm not sure of the names but he was on 4 of the 5 at one time. He has many developmental and neurological problems other than the blindness. We are not sure these were things that were caused by this infection, his gestational age or the fact I was 13 years old at the time of his birth. There are not a lot of cases like his and not a lot known about the medical problems that it may and can cause. He has severe cerebral palsy and a rare condition known as Dandy-Walker Malformation. Other than being premature he was perfect at birth. He contracted the yeast infection from another child in the neonatal unit. The child had a yeast infection on his skin and when one of Jakob's health monitors sounded the nurse rushed to his bed to care for him. The day before he had a plastic catheter placed in his chest so that the nurses didn't have to stick him with a needle to draw blood or give medication. The nurse who was handling my son did not realize how serious yeast infections can be and handled my son without washing her hands or wearing gloves. As you may know, yeast can and will grow on plastics. About a few days later when he started having problems with his kidneys and liver they began searching for a cause. That's when they found out this yeast was growing in his blood. The doctors started him on one of the anti-fungal medications and he did not respond well to it. So instead of taking him off of that one, they began adding other anti-fungal medications for him to take. 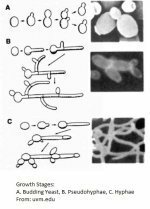 Yeast can become immune to medications after a while, so they attacked it with several at one time. It took about a month to rid his body of the yeast. We had our ups and downs through out that month with it attacking different organs and causing things with his body to happen. At 13 years old this was beyond my wildest dreams. How could have this happened to my baby. After everything it had filtered through is liver, kidneys, heart, and eyes. The only place that it caused serious damage is to his eyes. You could literally see the holes in both of his eyes. At 3 months of age his doctor wanted to remove both of his eyes. But we felt that his left eye had healed enough not to have to cause him the pain of removing both eyes and replacing them with glass ones. We got a second opinion and saved one of his eyes. But the damage had already been done. They may have saved his eye ball but 3 days after he was released from the hospital we went to see his eye doctor and they did an exam and determined that his retina had detached from his cornea causing total blindness. There are ways to fix a detached retina but since he had that yeast infection they were concerned about his eye being to fragile too perform that kind of operation on. So for now my son is blind. Hopefully we one day will possess the technology to perform that kind of surgery on eyes that fragile. People do not realize that just something so simple can destroy a life. My child will never know the beauty of seeing a rainbow or mountain or his favorite dog. He can not walk or crawl. A child who can see will pursue an object that they want, but a blind child does not know that item is there. We don't know what his future may hold but we hope for the best. For him to survive being born at 24 weeks gestation and to endure an infection that serious, we are sure he is a miracle child. Will you please tell me the name of your book so that I can go out and purchase it when it is released. Thank you so much for your interest in our story. If it can save just one person from having to experience the pain that my son, myself and our family felt, it's worth it. Maybe this will make people aware of how an infection that many people do not take seriously can nearly take or destroy the life of an unsuspecting person. Especially the life of an innocent child. I am never shocked about what yeast infections can do to a person but often when I read things like this I do shed a tear. The fact that Jakob was perfect at birth although premature leads me to believe that the yeast is indeed responsible for his subsequent problems. Cerebral palsy has been definitely linked to some kind of infection that attacks the brain when the child is usually a baby, as in Jakob's case. Yeast has the ability to do this once it enters the blood stream. You will also probably agree with me that babies having babies is a terrible thing to have happen, yet we all know it does happen folks. What happened to Crystal could have happened to anyone's baby. Jakob did not even have an immune system yet, and the ignorance of the modern medical establishment almost cost him his life. But, at least the doctors were smart enough to really go after the infection very aggressively before the yeast infection killed Jakob. What these doctors did to save Jakob's life does not even compare to what I mostly hear that doctors are doing today to treat yeast infections. People are getting one day diflucan, 5 to 7 day sporanox and their doctors expect them to be cured, and so do they. This is just not possible. Even though Jakob got the yeast into his blood from an incompetent nurse, it is on the rise in Intensive Care units and with critically ill patients worldwide. The many symptoms and problems can be varied as the fungus seems to attack the weakest organs in that particular person's body. Candida yeast does have an affinity for the kidneys and if it gets into them, it can shut them down resulting in death. It is Crystal's and my hope that you take yeast infections seriously. They can severely affect your health and maybe change your life as it has Jakob's. If you have read much on this website and have visited the systemic yeast infection pages, then you may have an understanding of how bad this can really be. That is, of course, if you believe it. I sometimes wonder how many people actually do that visit my website.